Warframe dev: Industry must get better at "giving players a choice and a voice"
With all the controversy surrounding loot boxes and microtransactions (MTX) in general these days, it's easy to forget that MTX aren't actually a terrible idea if implemented properly and with proper respect for the audience. There are numerous examples of games that leverage MTX to both the company's and players' advantage, and Digital Extremes' free-to-play title Warframe is one such example that's actually gotten even more popular recently. The Canadian studio's hit game has amassed over 30 million registered users since its 2013 release and just hit an all-time peak of 121,377 concurrent players on Steam following the launch of its Plains of Eidolon expansion in October. The expansion, which is now also available on PS4 and Xbox One, elevated Warframe to the second-highest played free-to-play game on Steam. Buzz for Warframe has never been better. As Polygon's Ben Kuchera wrote prior to Thanksgiving, "Why didn't anyone tell me Warframe is now the perfect game?" This isn't some happy accident. As Meridith Braun, VP, Publishing, Digital Extremes tells me, the studio has been learning and fine-tuning its approach to MTX over the last four years. She explains, "Over the last four-and-a-half years, media, influencers and players have often said that a couple of things have made them feel connected to Warframe. They have told us Warframe looks, feels and plays like a AAA game, but they are blown away by the fact that it's free. A variety of systems work extremely well. The controls feel good: Our hand-to-hand melee combat is fluid and fun; wielding hundreds of different ultra-powerful guns makes players feel incredibly powerful; and our movement and parkour systems give players the chance to bounce off the walls, jump, tumble, and corkscrew-leap through the air, pouncing on unsuspecting enemies. "The fact that we constantly update, fix, and improve Warframe means something to our players. And often, in the same sentence, they say they are blown away by the fact that we aren't a full retail game with paid DLC, and that the monetization we have integrated is more than fair. We're looking to redefine what free-to-play means to gamers." "Giving players a choice and a voice really matters. It's made a huge difference for us and it's a lesson the industry needs to get better at"
Indeed, the pillar of MTX has to involve building up a relationship with your player base. Listening to and reacting to their feedback is absolutely paramount. "We have developed a direct trusting relationship with our players, iterating and improving the game quickly based on player feedback (by quickly we mean within hours sometimes), providing meaningful forward-thinking content updates that continually add value and challenge to our players, and finally, we offer a fair non-intrusive pay model that respects our players wallets and time." Braun feels the controversy around Star Wars Battlefront II can be a valuable learning lesson for any game company pursuing MTX in a game today. "Giving players a choice and a voice really matters," she stresses. "It's made a huge difference for us and it's a lesson the industry needs to get better at. Whether it's a free game or a $60 game with MTX, monetization has to be built into the DNA of the game design itself to succeed. We've spent the past five years working tirelessly to present a fair business model to our players through thoughtful yet complex systems that keep them at the forefront of our decision-making process. "We've also spent that same five years trying to turn perceptions around on the poor reputation free-to-play and MTX has received over the past decade in the gaming community. Demand for high quality, entertaining gaming experiences will never go away, so there's no reason that kind of AAA experience can't come in the form of a free-to-play or games-as-a-service title." Obviously, one of the biggest problems around Battlefront II or other titles that have been met with friction is that MTX held back valuable content (like Darth Vader). That's just not something players are willing to tolerate. "You can earn nearly everything in Warframe for free over time without game or content progression walls," Braun continues. "There's also a trading market where players can trade items for premium currency along with a few other MTX-related systems that feel natural to the game. Those are significant choices that, from a business sense, can seem very risky. We realized early on that players hate being boxed in. They value and champion fairness and transparency -- which seems like common sense. But building that common sense into your game is much more difficult than it seems. In my opinion, the industry must learn to fight superficial MTX integration into their business models that ultimately destroy a player's sense of choice within the game and their perception of what is fair. Earning players' respect and respecting their interests will reflect in the bottom line." "What we're seeing now is an explosion of choices for developers and players. The game industry has vastly expanded in the last seven to eight years... It's not about console wars anymore"
Part and parcel with the learning curve that comes with MTX is the need to adapt to an industry that now practically demands games be treated as services. This evolution has accelerated dramatically even in the last couple years, but it's strangely familiar to Digital Extremes. 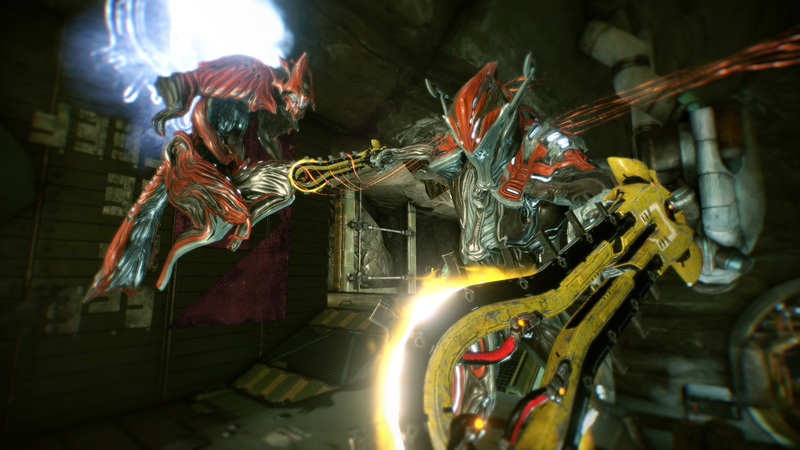 "We feel a little like Digital Extremes has come full circle now with its history," Braun says. "In 2018 we will be celebrating 25 years in the industry. We started in the shareware years in 1993 with Epic Pinball -- which has many similarities to what we see in free-to-play today -- and then moved on to 3D development with Unreal and Unreal Tournament alongside Epic Games. During that time we learned to nurture a mod community with free content and tools for players to create user-generated content. In many ways, our history prepped us for this turn in the industry, and now we're pouring all those years of knowledge into Warframe. "I'd say the biggest challenge we've faced so far is realizing that a games service is always on and needs constant attention. Adjusting our mentality and operations to manage that concept has been a bit trial by fire, but as the years have gone on, we've started to get into a good groove." Some studios get a little creatively burnt out working on the same IP for years and years, and launching a new IP is always a risky endeavor. Digital Extremes just had to suspend work on The Amazing Eternals, but sometimes knowing when to cut a title is what enables a studio to get to the next level. The Amazing Eternals would have competed for attention in the already crowded hero shooter genre. "We felt it offered a good concept, an original visual aesthetic and a great feel. But we found that the market it was about to enter was crowded, super competitive, and surprisingly unforgiving," Braun explains. "Many other titles in the genre are facing an uphill battle despite being good games. So, it's more about it being the right game at the wrong time." The industry offers developers enormous opportunities but it's more challenging than ever before. "It's always been hard to launch a successful game, just ask the thousands of great developers where, for every 10 games that are OK, maybe only one or two really succeed," Braun says. "What we're seeing now, however, is an explosion of choices for developers and players. The game industry has vastly expanded in the last seven to eight years in many ways. It's not about console wars anymore. There is no question that the PC has grown substantially as a platform. Steam is a big part of that. It has rocketed to new heights as a marketplace for indie and AAA PC titles. But it's far from the only choice or platform. In less than a minute, gamers can download a free high-quality game on their Android phones or iPhones. They can play free games on their browsers. It can be overwhelming to make a choice. "The barrier to entry for developers has never been lower between the technology available and digital distribution, which has only encouraged an abundance of many kinds of games that wouldn't have had a chance to see the light of day when the industry was primarily boxed retail product. The risk is lower now and the options are vast. It's a fantastic time to be a gamer." As for Digital Extremes' creative pursuits, Braun is confident that the team still has enough freedom to experiment within the world of Warframe that a new IP isn't 100% necessary. The Plains of Eidolon expansion has breathed new life into the game, almost like a sequel in a blockbuster franchise. Braun says the senior creative team "sees no end in sight for Warframe's direction," hinting at almost World of Warcraft-like longevity. But she won't make that comparison herself: "We can only hope we can be as successful as WoW." With all the success Digital Extremes has been enjoying, you might think it would be tempting to re-enter the premium console space. The studio used to work on big budget games like BioShock 2, Dark Sector and others, but Braun envisions her company staying with what has worked: free-to-play. "With the success Warframe has achieved and the knowledge we have acquired in this space along with the freedom of digital distribution and publishing the game ourselves, it's fair to say we're focused on becoming a strong player in the games-as-a-service segment of the industry," she comments. "Stepping back a bit, the premium console space is risky, but Microsoft's and Sony's consoles offer very healthy marketplaces, and Nintendo's Switch is doing really well, which is great to see. It's true, though, the nature of console games has really become more conservative. "On the one hand, we have seen many of the AAA publishers relying more on proven IP than in previous generations. On the other, we also have seen progress toward consoles picking up popular games from the PC, with players really getting excited about seeing Player Unknown's Battlegrounds coming to Xbox One, and PC stalwarts such as Ark: Survival Evolved succeeding well on consoles along with other newcomers like our friends at Epic with Fortnite and the Hi-Rez team with Paladins. So, there is room for growth across the board for new IPs and different kinds of games on the consoles. I see the free-to-play space growing across all platforms, especially on consoles. So we like where we're at. And we're looking forward to seeing more games embrace this model in the right way, too." "Even the best studios get pressed during the build-up to completion. So, we feel the crunch too. But our philosophy is your talent is your lifeblood"
Needles to say, none of Digital Extremes' success would be possible without its hard-working crew. The company has won a number of awards for being one of Canada's top employers in any industry. And in the games business, where crunch horror stories still persist, that's saying something. "Game development isn't easy, and even the best studios get pressed during the build-up to completion. So, we feel the crunch too. But our philosophy is your talent is your lifeblood," Braun notes. "We have established an atmosphere where our team members feel valued professionally and personally and we provide them with a really solid, supportive environment that encourages creative freedom. "With that said, it is a challenge to help those who have a natural drive to over-produce to balance out their lives and avoid burnout. On a title that operates 24/7/365 we are actively working to develop new policies that force people to take their vacation time if they haven't, to take extra time to decompress after big content pushes, and to provide fun company activities that help take their mind off the game for a few hours at a time." Braun says it's important for game studios to create an atmosphere that's both family friendly and fun. "We do fun stuff. As is the Canadian way, we have a company hockey team along with other sports teams," she says. "Earlier this week, we had St. John Therapy Dogs visit the office to take some time away from the computer and relax our staff with furry cuddles and cuteness overload. It might sound...silly or cheesy, but these little things matter. "Our philosophy as a company extends into our community and encourages being good citizens. We recently took part in the local London, Ontario 'Light the Night' Walk put on by The Leukemia and Lymphoma Society of Canada, a cause that hit close to home for our staff. Our staff and company matching raised the largest amount by any Light The Night London team on record - a worthy achievement. We also donate a large portion of the proceeds from our TennoCon event each year to a charity we partner with. This year we chose Covenant House Toronto. And coming up in December, we're working with our community of players to raise funds for our annual Warframe holiday drive called Tennobaum, which will benefit the local Children's Health Foundation." As Digital Extremes continues to reinvest in Warframe, the company may not be diving into new IP development, but it does believe it can benefit the industry from the publishing side. "We're considering growing through publishing external games-as-a-service titles to help impart the knowledge we've gained with Warframe and pass it along to other independent developers," Braun notes. "Our first effort in this direction is with the talented folks over at Human Head Studios on Survived By... Look for that in 2018." is this a paid ad? sure reads like one, it's nothing but PR quotes"
They've had a lot of momentum with Warframe, and we've decided to highlight it. Simple as that. They're a fantastic team and deserve all the plaudits they receive, it's a great piece James. They went through some incredibly trying times over the years and came back winners, we worked with them at THQ on an original IP that alas never came to light - but their passion and dedication were second to none. My oldest plays it a lot. I haven't had to time to dive into it myself but from what I've seen, I've been impressed. The recent game addition that moved from corridors to open world has been very well received. Warframe is probably one the most player friendly and non-invasive F2P model I've seen. It seems to follow an idea I heard once back in Spain that was "People loves to buy things, but they hate it when you try to sell them things. So don't try to sell them and make them buy from you instead" I think this people did things right and also delivered a hi-quality product that, when I play it, i sometimes forget that I'm playing a F2P game. Wish them the best and I wish for Warframe to last for more years to come.